Home Events Science Nation Tour Western Visayas: Making Science felt by Ilonggos! Science Nation Tour Western Visayas: Making Science felt by Ilonggos! Contrary to what others have believed that science is boring, the Department of Science and Technology (DOST) places its best foot forward to engage people from all walks of life the advantages of science, technology and innovation and how it affects them. Dubbed as the Science Nation Tour, the strategic campaign demonstrates the S&T spirit as alive, active and paves way to socio-economic development. 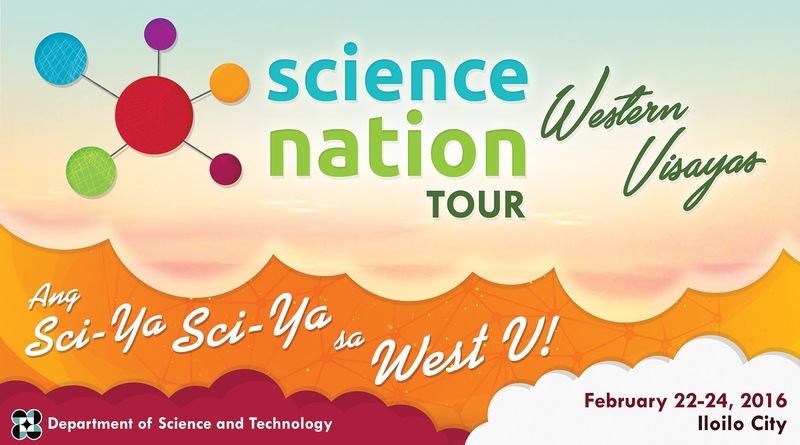 In Western Visayas, the Science Nation Tour which will kick off on February 22-24, 2016, will stage the various S&T programs and projects reflecting DOST’s bid to incorporate science in efforts towards progress. The opening of Tek-Tienda MSME Product Fair, for instance, will highlight the Small Enterprise Technology Upgrading Program (SETUP) – assisted products in the region. The implementation of SETUP enables these growing MSMEs to address their technical constraints through various S&T-packaged interventions. Project visits on SETUP beneficiaries will also be scheduled. The project visitation aims to underscore DOST’s high-impact technologies and S&T interventions geared towards MSMEs’ empowerment in the countryside. DOST Secretary Mario Montejo will lead the launching of the Free-WiFi Project. Initiated by the DOST-Information and Communications Technology Office (ICTO), the big-ticket project is poised to provide internet connectivity among public places – from plazas, government offices, health units, parks, and transport terminals. With this available internet, people’s lives will get even better as they can gain access to e-commerce, weather information, researches, and education, among others. The Philippine Science High School (PSHS) – Western Visayas Campus will also highlight science exhibits with hopes to stir students’ interest in S&T and research. The introduction of Network of Experts in Science and Technology (NEST) to the public will serve as gateway to a vast compilation of knowledge holdings. This IT-based portal encourages the involvement of local scientists, researchers, engineers, inventors and other technical people from both the public and private sectors in addressing S&T problems of the country. In addition, committees on the Regional Development Council (RDC VI) will convene to discuss S&T priority projects. This is to track the progress of these undertakings, formulate policies and implement plans attuned to regional development objectives. The event will also award stakeholders, key personalities and DOST scholars who strongly support S&T endeavors in the region. Other activities include Sci-Fit, and inauguration of the Iloilo Doppler Radar and Synoptic Station and ceremonial turn-over of RxBox.